Term life insurance is what many insurance experts consider to be the purest form of life insurance. The reason is because it truly does provide life insurance protection instead of making the policyholder pay premiums that provide the eventual cash benefit. Most term life policies also expire with no death benefit paid. That happens because the insured individual almost always outlives the term for which the life insurance policy provides financial protection. With term life, policyholders don’t have to undergo health exams or pay high premiums like whole life insurance plans require. Term life is much easier for insurers to underwrite than whole life insurance. Those looking to buy term life coverage need to just give their basic personal and health information, which insurers then use to compare to actuarial tables and determine the amount of the premium needed for coverage. Most term life insurance plans do not require any kind of health exam. Many also can be converted to whole life insurance if the policyholder so desires, but the premium will rise. 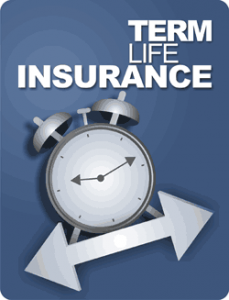 Most term life insurance policies also have guaranteed renewals so they can be extended when a term expires. Term life insurance works best for helping to ensure home mortgages can be paid off if the main breadwinner should suddenly die. Most families in the United States do not have enough life insurance to prevent a sudden drop in a family’s standard of living if the head of household dies, and that means a lot of home mortgages likely won’t be paid off due to a lack of life insurance coverage. Term life insurance offers many affordable options to prevents such things from happening, and a decreasing term life insurance policy is ideal to protect family homes and other financial interests. Have you considered buying life insurance to protect your family?